Enter the multiverse of the largest music and performance spectacle you’ll ever experience. 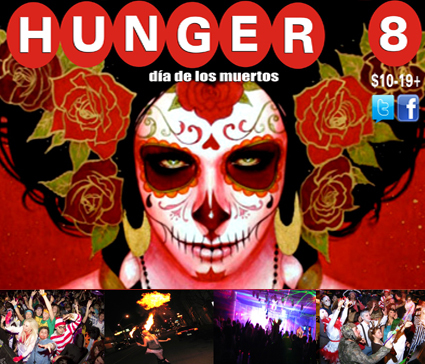 The Hunger 8 is a Halloween event of epic proportions, featuring 52 Bands, Dj’s and Performance Acts. So massive an event, it will take up 7 bar venues… Crock’s, Black Pirates Pub, The Foundry, The Sovereign Room, Gargoyle’s, A Little To The Left and*HELL. Thousands in prizes for Best Costumes at each location! Pick your story, diabolic or devilicious. Move between bars and interact with every soul along the way, you could even win prizes in the street. Feed your hunger with a night of death defying performances and orgiastic maneuvers of delight…. Thousands in Costume Contest Prizes at all locations. THE SOVEREIGN ROOM-delicious food, when you need to feed! OUTDOOR PERFORMANCES- outside Black Pirates Pub and spontaneous performances in the streets at other venues. **ERIC THE JUGGLER-[knives/fire…souls]+ DEE MARIE [flesh & fire!] + FLASH BURLESQUE w/Les Couquettes Rouge + NECROMANCERS GORELESQUE-Watch for them! A LITTLE TO THE LEFT-enter via Gargoyles-A Multi Media Space-Big Screen Videos and THE SUGAR SHAKEDOWN CREW-with its own bar-Gargoyles is right next door, you don’t even have to leave the building…here you get DJ’s/Projections and Live Music simultaneously all night long! …advice come early, 3,650 in attendance last year and you don’t want to miss a thing!